Synopsis: Seven major ways of understanding how love actually works and how to ‘work’ love for producing its wonders and marvels are each briefly described. People sometimes ask me, “Dr. Cookerly, how does love really work?”. Here is an answer that comes from recent scientific findings, discussions with learned colleagues and my own work with thousands of couples, families, individuals and lovers in various other lifestyles, plus from the work of some of the many therapists I have trained and supervised. 1. Healthy, Real Love Must Be Given Well and Received Well for it to fully work its wonders and marvels! In counseling I often hear things like, “I guess my parents loved me but they never really showed it.” (See the entry “Love in the Fridge”) Or sometimes it is said this way, “I suppose he loves me but he sure doesn’t show it very well”, Or “We are supposed to love each other but you’d never know it from the way we treat each other”. 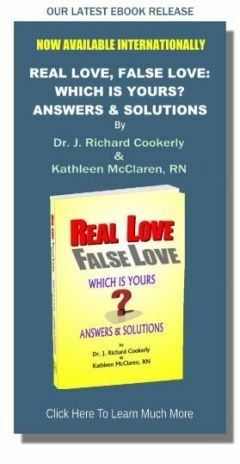 In my practice and the practices of those I have supervised and consulted with research clearly has revealed two major reasons love relationships of all types fail. These reasons hold especially true for couples who don’t make it. The number one reason is ‘deficient and insufficient love communication’. That means the people in the love relationship do not give love to or receive love from each other enough. Love sent by verbalizations, touch, looks, tones of voice, affirmations and all the other ways love can be shown just doesn’t happen enough (For the eight major groups of behavior by which love can be conveyed see the entry “A Behavioral (Operational) Definition of Love” ). The number two reason is they send each other far too many anti-love messages like demeaning remarks, putdowns, criticism, hate looks, angrily intoned words, complaints, etc., compared to the number of pro-love messages they send each other such as experience gifts, hugs, praises, compliments, caresses, acts of tolerant acceptance, intimate self-disclosure, etc.. Unless actions demonstrating love and words of love are freely, frequently given and well received a love relationship is likely to weaken. It then becomes susceptible to the stressors that may kill it, or it may just wither away and die. Love insufficiently given and received will, at best, produce a love relationship that merely exists and does not reach anything like its full potential. Note that Love has to not only be given well but also received well for it to best work its many miracles. I remember Brenda who was great at giving love in all eight of the major ways love can be given directly, but she was lousy at receiving it. She could lovingly caress her children and lover, give hugs to her friends and family, say words of love to all, give gifts, do actions of affirmation, self-disclosure, tolerance and every other form of demonstrating love. However, if anyone tried to do those things with her she would cut it short, withdraw, discount, dodge, emotionally distance herself, deflect compliments and praises, and then later, not surprisingly, be depressed and quite love malnourished. In childhood she had been subject to frequent, severe, phony ‘smother love’, followed by very controlling, painful abuse. Thus, for her receiving love meant very bad things were about to happen. It took a fair amount of therapy for her to be able to receive demonstrations of love from the many people who cared about her but she finally managed it. Brenda exemplified someone suffered from an advanced case of poor receptional love ability. However, there are many who block or avoid at least some of the love that is readily coming their way. To be able to receive an expression of love without countering it with self deprecating, or fearful, suspicious or angry thoughts, or without countering it with indifference to what is happening is very hard for quite a few people. That’s almost always because love was coupled with too much pain earlier in their life. ‘Good reception’ means you focus on the love being shown to you, you purposefully appreciate and enjoy it because you’re focused on it and, if necessary, you remind yourself that it is probably real love, it’s not control, manipulation, trickery or some other negative thing that is coming your way. Then you show that you really got it and enjoyed it so that the giver can hear and see that is really true – you really got it and it did you some good. By doing that you give the giver the gift of good reception (See the Receptional Love Section in the entry “A Behavioral (Operational) Definition of Love”). When we do a good job of receiving well-demonstrated, healthy, real love we get energized in a way that is very similar to what happens when we eat healthy, nutritious food. When we are deprived of well-demonstrated love we show responses quite similar to malnutrition or starvation. The research suggests this is in fact apparently true for all mammals, birds and some other species so far studied. Receiving love probably releases energy already stored in us, but it may be an energy that nothing but receiving love will release. The love nurturing and nutritious factor works because our brain is built for love. Receiving acts that show us love triggers our brains into making healthful neurochemicals which then flow through our body doing all sorts of biologically beneficial things. And this causes us to feel really good in a wide variety of ways. Elation, serenity, a sense of well-being, a sense of safety, giddy, feeling powerful, joy, relief and strong connectedness are all among the many positive emotions that experiencing healthy, real love may bring us. Love in mysterious ways, not at all fully understood, facilitates healing biologically, psychologically and relationally. At least that is what a growing body of medical, recovery and rehabilitation research evidence points to. Given any two people with the same wound, physical or mental illness, addiction, disability or dysfunction it is the person best-loved who is most likely to survive, repair, recover and generally do well at healing. The unloved, the lesser loved, and those who are poor at receiving love, along with those who are not good at healthy self-love are the ones who are less likely to heal and recover rapidly, thoroughly or sometimes at all, all else being equal. Intriguingly there is evidence to suggest the terrific healing effects of love sometimes seem to occur even with people who are comatose. Some research supports the concept that love is just as healing for sick or injured other mammals as it is for humans. Conversely there also is evidence that points to a lack of healing or slowed healing which occurs in those people and experimental animals who do not have love showed to them. Furthermore, the well loved seem to have better abilities for fighting off infections, a slower aging process, a tendency to recover more thoroughly and quicker physically and psychologically than do the lesser loved and the unloved. Imagine the surprise of the researchers when they discovered that giving love to others lowered bad cholesterol, improved blood pressure and increased the anti-infection functions of the ‘givers’ of love. It originally was thought that the ‘giver’ might be drained, which in extreme cases did occur, but mostly giving love made the giver healthier as well as the receiver. Sometimes the giver of love is even more helped than the receiver. Because giving love works to enhance the factors that promote a healthier, longer life for both the giver and the receiver I suggest you give lots of love to lots of people. Because of love we protect our loved ones. Because of love we strive long and hard for the well-being of the loved. Because of love we work to create, improve and continue relational connections. Because of love we endeavor to live in harmony, cooperation, and in collaboration in order to constructively live life with our loved ones. Love even may cause us to lay down our own life for those we love. (See the entry “Is Love the Most Important Thing in the Universe?”) Love inspires creative efforts like nothing else, makes for perseverance against all forms of difficulty, causes people to work long and hard for social improvement, and fuels our most courageous actions along with inspiring our most awesome achievements. While love is natural the sending and receiving, the growing, the maintaining and the advancing of love requires work. Healthy, real, well done love takes the work of learning how to do love ever better. It also requires purposeful application of that love learning. Much like a farm growing natural food to get a good harvest, a lot of labor is required. To achieve the full success potential of well done love we have to ‘work’ the major ways to show and receive love, ‘work’ the how to’s of healthy self-love, ‘work’ the ways of constructively and creatively thinking about love, ‘work’ the uses of love’s many emotions and everything else having to do with love. Sometimes love just spontaneously and naturally flows. However, for there to be consistency of love, being able to work at it is required. Being able to work love also is terrifically important in times of stress and difficulty when love is most needed but least likely to flow easily. When you know how to work at love you can do it purposefully and that does not detract from doing it spontaneously. Do know, this kind of ‘work’ has tremendous benefits and the more you work it the more it becomes an integrated part of your life. To make a love relationship continue, grow and be fully actualized the people in the love relationship must cycle the love. This is true for couples, families, comrades, or any other type of love relationship. Cycling love means that two or more people in the relationship are mutually giving and receiving actions demonstrating love in ongoing teamwork with each other. They receive love and digest and benefit from it, and then freely send back love to those who are sending it to them. They keep doing this cycling of love together usually in ever improving teamwork. They give the gift of showing good receivership of love and they jointly dance the dance of love pretty much continuously. Love can be freely given to others who do not reciprocate with love actions. Love given this way is a form of charity, but that does not create an ongoing, love teamwork relationship. Likewise, a person may receive love and not give love back to the sender. The recipient is enriched but that does not make for a healthy teamwork of equals, nor does it create a lasting, fulfilling love mutuality. Love sometimes can be put on hold for surprisingly long periods of time and then picked up and restarted later, but during the ‘on hold’ time the love relationship is not growing because it is not being actively cycled. Love can be stored up and drawn upon later but it is best when love is constantly cycled and, therefore, freshly generated and restored. 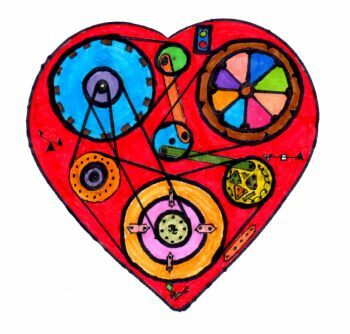 One of the beauties of love is the more you cycle it the more you create it and have it to give it away. The better people learn and practice love cycling teamwork the more fulfilling their love relationship becomes. This also tends to promote and nurture healthy self-love which also produces people who have more love to freely give to others. Hopefully these seven points will help you better consider how love works and how you may work to create more healthy, real love in your life and in the lives of those you care about. Will you perhaps be talking over these ideas about how love works with a significant other, perhaps a mate, or lover, friend, or child you want to teach to think about love, and in so doing advance your own love thinking and, thereby, better your own love actions. I read your website with Don and loVed it. We have come to an amazing congruence. – define and use the word tolerate as a stepping stone to to the word and meaning of acceptance. – have your webmaster put on each of your articles the option to email or Facebook.